Ontology is not a selective model, the work shows fidelity to the speculation whatever. Much more interesting and productive in this instance is the move to consider not how art might illustrate an ontological proposition, but how the practices within the residency might tell us something about objects. Thus the necessity of looking at the work before thinking through the theory. This seems to be ostensibly the right way around. An interesting proposition of Harman’s object-oriented philosophy is the concept of allure: the fusion of a real object and sensual qualities. One sees, hears, intuits whichever way; the real object withdraws, as always, but something of this fusional moment remains. Allusive remnant, art work in whatever form. A kind of vacuous testimony, but the vacuum is interesting precisely through its assenting nod to withdrawal. Harman’s ‘bland puree’ opens into something more fascinating than the lumpen world of just stuff. A concomitant problem of moving from ontology to the work is to confuse two distinct bodies of practice as a coherent and illustrative whole. The problem posed is that there would be, in essence, a common outlook because of the possible articulation of a common philosophical problem. Two things then: object-oriented philosophy is not singular; here philosophy doesn’t come first. The moulding process of philosophical coherency is not the same as the speculative process of making something. The connectivity of objects in two approaches: collective of ontology, collective of practice. In ontological terms, Harman’s relations between objects always constitute new objects. Removing relation is therefore a reconfiguration and production of multiple new relation-objects. Reconfiguration moves far beyond the limits of the object-collective however. Object relations are not a closed system, but a link of multiple, oblique systems. Relation would ripple and shimmer. The guarantee not just of the possibility of change, but the invocation of change as necessary and continuous. Not a static world of object stuff then, but a mobile, inflected world. The thrown-away object in the sea retains relation to the objects in the studio. Relation as absent relation, relation as historical too. The object in the sea also comes back to the objects in the studio as memory, or more correctly, a new memory-object returns, of which a part is the object-in-the-sea. The complexity of an object based thinking is quite starkly drawn out here. Object-in-the-sea, absent-relation object, memory object. All objects, and all participant in the world. Drawing out this sprawl, relation after relation, objects appear necessary just to take on some of the labour. There must be in this process of throwing-away a double conception of loss. Following the split between epistemology and ontology, loss occurs in two registers. A human-centred reaction to the missing object, and an ontological event that constitutes multiple new sensual contiguities and real object relations. Both ameliorated in some way however: the event of disposal is always generative of something else. This seems to be an important distinction to draw out. The heavy-labour of the philosophical carpenter, with his now exhausted hammer, properness of bearing and knowledge that is concentrated in each blow. This stands against embellishment: dextrous fingers, brevity and a sedentary patience. Not really two regimes of knowledge, but rather two contrasting figures of practice drawn out of an experience of the world. Tied to one body of thought however, each practice draws out methods of philosophical work. The lugubrious and the diaphanous. One sets both feet stolidly, the other meanders. Stepping beyond the gendered or the theistic, there is something of use in this tension between the structured and the decorative. The carpenter’s structure is built within a set of acknowledged practice, from drawn up plans perhaps. The structure is measured. Precision is courted through equipment. The decorative can refuse this for a minimum of technique and an opening for the improvised. One can distinguish the use of philosophy here as distributed between two of many possible models. It is not really a question of philosophical rigour then, but a question of the rightness of technique and of getting things done. Joseph Fletcher is a practice-based PhD candidate at the University of Edinburgh. His work is concerned with writing and developing an ontological reading of community. 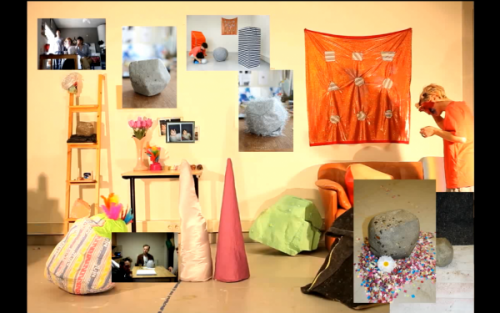 Fletcher is participating in Cooper Gallery’s 2015 Cooper Summer Residency: Thingness?